Shred cabbage very thinly, 2mm or slightly less. 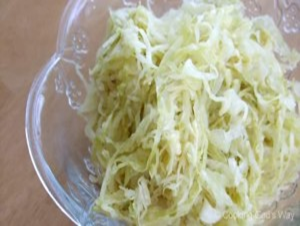 Place a few small handfuls of shredded cabbage into the bottom of quart-sized jar. Sprinkle this cabbage with some of your sea salt. Gently tamp, pound, the cabbage down in the jar with a flat rolling pin or a wooden spoon. Repeat this until all the cabbage and salt is used up (this should happen at about the same time, so try to use up your salt evenly). Loosely cap the jar, set it aside for 30 minutes to allow the cabbage to self-brine. Press down on the cabbage, checking how much brine the cabbage made. If necessary, make up the extra brine and pour just enough over the top of the cabbage to completely cover. Keep in mind that the cabbage with soak up some of the brine during the fermenting process, and we want the cabbage to stay moist throughout. Place air-lock lid on the jar tightly. If using air-lock fill with water according to instructions. Allow to ferment, at room temperature, for 7 days.